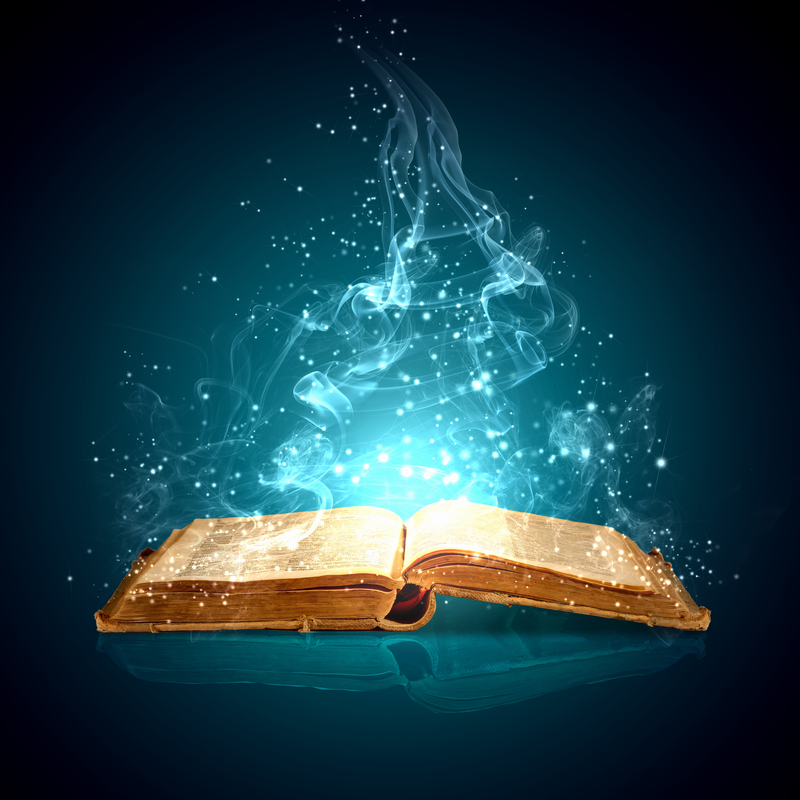 A sorcerer can invoke a magic incantation and enchant you with a spell. All they need is to speak some well ordered words, give voice to a crafty verse and the tale is told. I am not speaking figuratively, I mean it literally. In Old English a spell meant a “story, saying, tale, history, narrative, fable; discourse or command”. A speller was somebody who read out words and the title was most often applied to preachers who would read the “good spells”, or good stories, which became the God spells and finally the gospel. It is from the action of “spelling”, reading out the story word by word, that the term changed it’s meaning and became attached to the letters rather than the narrative. Being enchanted is also far less weird than you are probably thinking. The “en” means “in”, the “chant” bit is just that, some poetic words. Chant goes back through French and latin all the way to a Proto-Indo-European (PIE) root word: *Kan- meaning “to sing”. This is pretty easy magic to be honest, all you have to do is sing a well known song and if people join in then they have become “sung in”, you have enchanted them. An incantation, for all its portentous sound, is exactly the same thing, “in” and “cant” having come from the same roots as “en” and “chant”; it is another “in song”. To “invoke” it you only have to speak it, or put it “in voice”. But what about magic? There is a postulated PIE root *Magh-, meaning “to be able, powerful”. By the time of the early Greeks we have “Magos”, a noun which means “a learned person of the priestly cast”. The powerful capability lies in the learning but you can only get access to that knowledge if you are born in to the right tribe. The power this tribe of capable people wielded became known as “magike” and, since they weren’t sharing, it was obviously very mysterious. I realise I have just explained where the word “magic” comes from but not what it actually is. Bear with me and I shall unravel this final part of my spell. There is another Proto-Indo-European root I would like to introduce you too: *Ser-, which has survived in our own words series, serried and sermon amongst others and means “to line up, put in a row, or thread together”. It has also come down to us through the Latin for “one who influences fate or fortune”, which in English is a Sorcerer. So, somewhen between these two ancient lexical points, someone was exerting influence on things, effecting change, by putting something in order, by arranging something in lines. Given everything we have just been talking about, it seems clear to me that the magic power of the bygone Magos was sorting secret symbols in to charms and spells. Yes, charm is another word from that *Kan- root. Or to translate from magical language into mundane: the mystery capability of the first sorcerers was lining up letters to make words and arranging words into songs and stories. The carefully guarded learning of the earliest magicians was poetry, storytelling, writing and reading. So if you sometimes yearn for a more mystical life, remember you too can type some terms in to a tidy row or organise some expressions in an exciting order then speak or sing your scintillating spell, who knows what effect you might have? Words are magic, in every sense, and in every sense magic is words. The relationship between oral tradition and literature is as complex and fluid as the relationship between any immortal and deific parent and child. Writing was the offspring of Commerce, born amongst the hustle and bustle of the earliest cities, dedicated to a life of record keeping, trapped in rigid columns. Although Story was ancient she never aged, being born anew every time she she was spoken, kissed in to vital life by each pair of lips she passed. As Writing grew amongst the trappings of trade, he developed his powers of description, struggling for accuracy, detailing the specific. Story, ever seeking new experiences to incorporate in to her repertoire, was drawn to Writings descriptive skills, impressed by his unfailing memory. Writing was barely old enough to grow a beard when they met but Story teased him with adventures, one moment wild and exotic, the next full of homely warmth. Seduced by Story’s enigmatic beauty and the worlds of wonder she laid before him, Writing broke free from the constraints of the trade ledgers and set out to woo Story. He followed her faithfully across the lands and hung on her every word. Flattered by the attention Story gave herself to him, fell breathlessly under his stylus in his bed of clay… and in the heat of their union Literature was born. Though they often travel together, Story remains ever young and fresh while her daughter, Literature, stiffens with age. Writing, trained from birth to be pedantic, constantly complains of Story’s inconsistency. Sometimes Literature tires of her mother’s flightiness and will endeavour to trap her in her pages. Whilst Writing still loves Story he loves his daughter more and will often side with her. Together they bind Story in chapters of finely woven prose. Sooner or later one of Story’s old lovers will find her, recognizing her grace behind the lines of greying grammar. The storyteller, who loved her as she was and loves her just as much as she is now, tickles her with their tongue and, laughing, she slips free from the chains of ink and dances once more in the air, leaping from mouth to ear as husband and daughter follow behind entranced, reminded of their love, desperate to catch her again.